Despite any mention of April Showers, these days I find myself singing that old Irving Berlin song ‘Blue Skies’… “Blue skies smiling at me” - such a beautiful idea – to know that the sky smiles down on us. 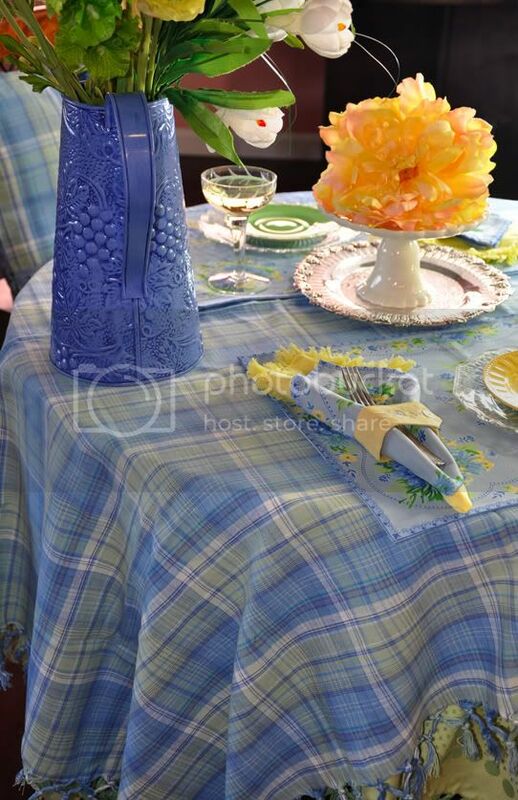 Whether outdoors or in, I love to recreate the beauty of a blue sky on my table. 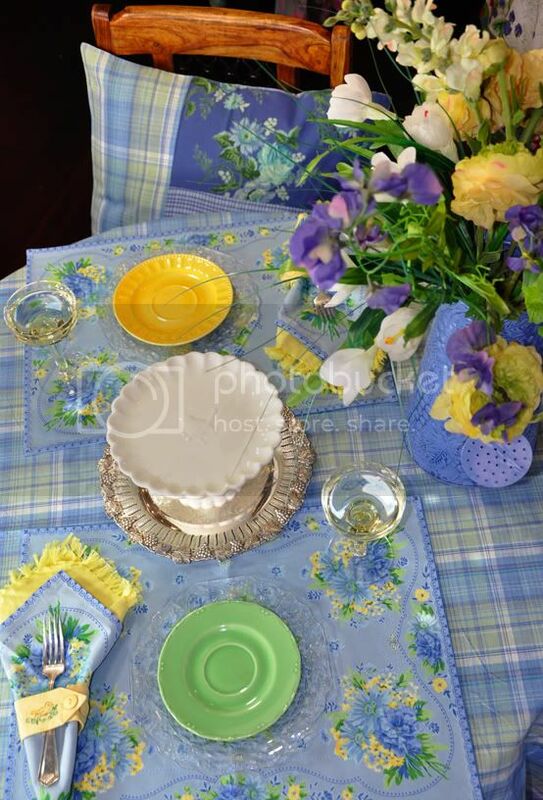 Layered here, on this quaint little table for two, is the Shannon Plaid breakfast cloth. 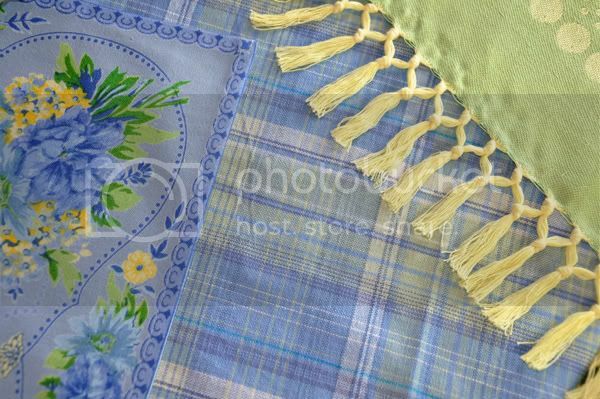 Its powdery blues and soft yellow weave give it a wonderful country flavor and provides the perfect base for the Josephine Blue placemats. Named after my beautiful, vibrant granddaughter, the Josephine brings a gentle floral aspect to this scape while hints of sunny yellow add a cheerful note. The coordinating napkins are double-layered over Essential Napkins in pale yellow to bring forth even more sunshine! Napkin cuffs add a dash of sophistication while fresh floral arrangements herald the coming of our beloved garden season! With a table so fresh and welcoming, why not linger in comfort as well as style? Here the chairs are lined with comfy pillows in the Shannon Patchwork collection – a symphony of blue floral prints and plaids – once you sit down, you’ll never want to get up! Here’s to beautiful spring blue skies and warm sunshine – when you smile up at them, rest assured they’re smiling back. I LOVE beautiful blue skies, and I just love blue with yellow! I was just looking at these yesterday for something to go with my blue willow china. 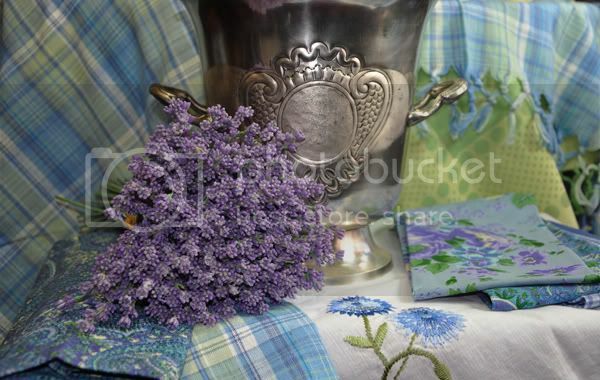 I just ordered the poet jacquard forest napkins and the daisy yellow beaded napkin rings in hopes they will go with my vintage Noritake Condoro china. I honestly just love everything. You are amazing!! Absolutely gorgeous!!!! I want to order each and every piece. Wonderful table, the perfect blue sky. 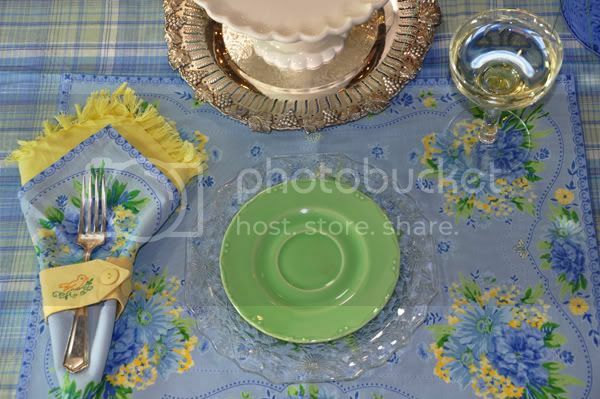 Love your tablecloth and those pretty placemats. Lovely! Everything is well choosen and I love every piece. Enjoy your day & have a great w/end to come. Gorgeous! Your linens are beautiful. Thank you fro sharing them. I had to gasp when I saw this setting. It is so beautiful! I've been looking at the blue and yellow combo lately so when I saw this it was like you had read my mind. I adore those little napkin rings too. Very sweet. Truly inspiring! Thank you April for such lovely images. Surrounding ourselves with beautiful things makes a day so much brighter! 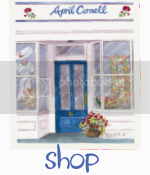 My husband and I were missing your lovely stores in out area. We always purchased several new tableclothes, and accesories each year for our bed and breakfast. Ahh, a trip down memorie lane!..,How well I remember your lovely booth at the old C.N.E. in downtown Toronto as well! (I still also have many of your dresses, which I also almost forgot to mention).., I love them! Thanks once again for continuously inspiring me these many years! ~ Here is the link: www.blueforest.ca.., Please enjoy! Do pop by and visit one of my blogs sometime April! Oh this is so beautiful. I love the color combination of blue and yellow, and both the placemat and the napkin are the prettiest blue and yellow ones I've ever seen. Pretty napkin ring too! Oh, what stunning table linens! LOVE the little napkin cuffs -- too sweet! Blue and yellow is one of my all-time favorite color combinations. My everyday dishes combine those colors with orange, and I love them. Gorgeous. 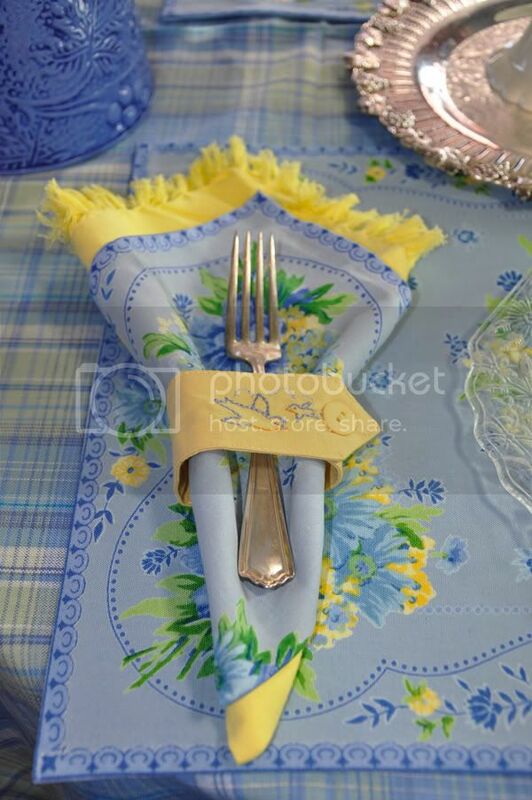 Love the yellow napkin ring, so very cute. Your linens are so wonderful!!! How beautifully blue. And yellow. It is just lovely. Thank you for posting it. So beautiful! I love the napkin rings! Keep inspiring me April! Love the shade of blue. Is that a blue watering can I see? It looks fabulous! Beautiful April..I love blue and yellow! April, my favorite month, full of birthdays, and fresh spring. You have created a stunning collection of beauty on your table. And you used my favorite colors. LOVE THIS!! So sunny & cheery!